CONICET researcher who coordinates the project describes the international geodetic station that was installed in the city of La Plata and involved an investment of US$ 20 millions. Dr. Claudio Brunini, CONICET principal researcher and Scientific Director at the AGGO. Photo: CONICET Photography. 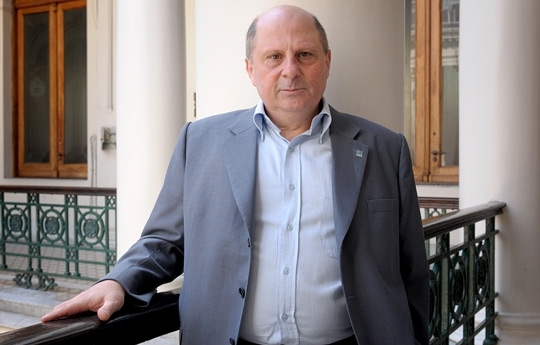 Claudio Brunini, PhD in Astronomy, researcher at the CONICET and professor at the Universidad Nacional de la Plata (UNLP) is the Scientific Director of the Argentine-German Observatory (AGGO). The observatory is equipped with cutting-edge technology, a radiotelescope, a laser telescope and satellite receivers that will allow obtaining vital georeferenced data for national and international research. What is the aim of the geodesy? Recently, the International Association of Geodesy (IAG) celebrated its first 150 years of existence, what places this organization as one of the oldest International Scientific Associations. However, its main objectives are hardly known by the scientific community (who tends to attribute them to geophysics or geology), and even less in the case of non-scientific sectors. One of these essential objectives is to promote the terrestrial reference frame. In the past, this area was executed in isolation by different countries in order to support cartography and territorial regulation. Subsequently, the extraordinary development of the measurement techniques based on artificial satellites and astronomical objects located in the confines of the universe, generated the need of a global reference frame that juggles the geospatial data that has become global. What is the goal of the geodetic reference frame considering this current context? Today, the frame of global terrestrial reference has to withstand demands that exceed the ones that come from the cartography and the territorial regulation, or, as it is said now, of the spatial data infrastructure. The main challenge of our time is to establish a worldwide ultra-precise and time invariant frame of reference. The idea is to study geodynamic and global change processes that affect the ‘Earth System’: the changes in the planet rotation, crustal deformation, earthquakes, volcanism, glacier dynamic, sea-level changes, water cycle dynamic, among others. AGGO is the acronym that identifies the ‘Argentine-German Geodetic Observatory.’ It is a fundamental geodetic observatory that gathers all main measure techniques of Geodesy. It was developed and built by the Federal Agency for Geodesy and Cartography (BKG in German) of Germany. The premise that guided its development was the possibility to transport all its components involving high degree of integration allowing a relatively simple deployment in any chosen destination. This responds to the necessity of improving the coverage of geodetic networks of global observation in the Southern Hemisphere of our planet. What elements will this geodetic station have? The AGGO will operate with a variety of scientific instruments of cutting-edge technology: a radiotelescope, optical telescope for laser telemetry to satellites, a unit of time that combines Caesium atomic clock and a hydrogen maser, a gravimetric unit that combines an instrument of absolute measure and a superconductor, several GNSS receivers, a seismometer, meteorological instrumentation, etc. This provides unprecedented opportunities to address a number of scientific investigations. How was this binational project born? The possibility to install the observatory in Argentina appeared in mid 2011 and it aroused the interest of Argentine and German scientists. The CONICET envisaged that opportunity and supported the initiative till it became a project that today has a deadline: in 2014 the AGGO is going to start operating in Argentina, specifically at the IAR, CONICET in the city of La Plata, Buenos Aires. How is going to be the international integration of the AGGO? The structure is integrated by a variety of scientific services coordinated by the IAG. The AGGO will contribute with six of these international services: Earth Rotation and Reference System Service (IERS), Very Long Baseline Interferometry (VLBI), Satellite Laser Ranging (SKR), Global Navigation Satellite Systems (GNSS), Gravitational Field and the International Bureau of Weights and Measures (BIPM in French). Why deploying the AGGO in Argentina? The main geodetic observatories – such as the AGGO – provide the foundation of the International Terrestrial Reference Frame (ITRF). As is known, the foundations have to be well distributed across the length and breadth of the building where the observatory will be placed. In the case of ITRF, this ‘building’ will comprise the entire planet. That is why it is necessary to have fundamental geodetic observatories well distributed globally. The AGGO is the only observatory of this type in Latin America and the Caribbean. The installation of geodetic observatories in Argentina will allow that part of the foundation that supports this region of the globe remain resilient. What advances have been made in Argentina within this project? The first phase of this project was oriented towards the definition of the principal scientific aspects of the cooperation that will be promoted between Argentina and Germany. Among the short-term objectives, Argentina was proposed for the building of infrastructure to host the Observatory, its installation and functioning. These tasks are being accomplished and the Observatory is ready to work and produce data. The personnel who will use the devices have been provided with specialized training. The AGGO involves 20 people with different degrees of qualification and dedication – from advanced students to engineers and scientists. As an researcher, what are your contributions to this project? At present, I coordinate the project and the tasks oriented to the display and future utilization of the AGGO in Argentina. One of my objectives is to design long term plans to promote scientific cooperation between Argentina and Germany within the framework of the AGGO, especially in the training of human resources. I am totally aware of the effort the CONICET makes and the expectations related to the contributions of this project to the scientific community and most Argentine institutions. Regarding this, I would like to remark that all information obtained from the AGGO will have restricted access and it will imply horizontal cooperation from scientists of both countries in all future projects. Personally, my work has been geared towards the study of the earth upper atmosphere and the improvement of the terrestrial reference frame in Argentina and Latin America and the Caribbean regions. The relationship between these two apparently unconnected topics is the use of space-geodetic techniques to study the atmosphere and materialize the terrestrial reference frame. How is the AGGO financed? It is a joint project between the CONICET and the BKG. The latter grants all instruments and it costs approximately US$ 20 millions and the CONICET will provide infrastructure works necessary to install the Observatory, whose cost has been estimated at more than ARS$ 10 million. As regards the staff for the Observatory, the BKG is going to support two German scientists during the period of five years and the CONICET will be responsible for providing the rest of the necessary personnel. The costs of the operation will be financed by the Council while the instrument’s maintenance and update over the first five years will be in charge of the BKG. Claudio Brunini holds a PhD in Astronomy. He has been a CONICET researcher since 2003. He is a proffesor at the Faculty of Astronomical and Geophysical Sciences of the National University of La Plata. He is a member of the IAG Executive Committee and he is the chair of the Commission in charge of the Geocentric Reference System for the Americas (SIRGAS). Besides, he was part of the Committee of the Publisher Journal of Geodesy and he was granted the George Foster Research fellowship of the Humboldt Foundation. The AGGO was officially inaugurated on July 23rd at the premises of Instituto Argentino de Radioastronomía (IAR), under the scope of the CONICET, and part of the Comisión de Investigaciones Científicas (CICPBA) [Scientific Research Commission]. The Observatory has new measurement instrumentation that will be part of the global infrastructure for the observation of the Earth.